The Lau Lau SUP Paddle, by Kialoa Paddles, is the lightest but also the strongest paddle of KIALOAs IKAIKA Series of SUP paddles. Considered by many to be the ultimate in performance and durability, the Lau Lau SUP Paddle is for those who demand the most of their stand up paddle. The Lau Lau stand up paddle is available in two blade sizes; the small blade has a width of 7 ½ inches and the large blade is 8 ¾ inches. Surface Area: Large blade is 100 inches squared , small blade is 89 inches squared. 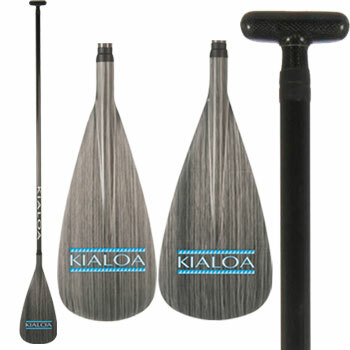 Small Blade Width: 7 ½"
KIALOA makes beautiful, cutting edge, hand-made SUP paddles from the United States since 1991. KIALOA's business philosophy still retains its Hawaiian roots, claiming Po'okela (excellence), Malama (stewardship) and Laulima (teamwork) as their core values. The IKAIKA Series is KIALOA's recognition that the field of stand up paddling is missing a line of SUP paddles made specifically for beginners, or for SUP paddlers who aren't very serious about stand-up paddling just yet but instead want to see if the sport is for them. It draws its strength and toughness from the discovery of revolutionary Continuous Fiber Reinforced Thermoplastic (CFRT®) technology. CFRT supplements the performance benefits of carbon and glass fibers with the strength of thermoplastic polymers, creating light and yet effectively indestructible paddles at an incredible price.